Given who’s promoting the Foxconn deal, workers have a good reason to be skeptical. The plan, if fulfilled, would be seen as a political victory for President Trump as well as Wisconsin’s right-wing Governor Scott Walker, both of whom campaigned on boosting American manufacturing. Walker has spent his seven years as governor attacking workers’ rights and living standards. Meanwhile, Foxconn, the multinational corporation known for manufacturing the iPhone, is even better known for the high rate of worker suicide in its Chinese factories. Despite the populist rhetoric behind the Foxconn deal, it’s more about corporate welfare than anything that would benefit WIsconsin workers. An agreement between Foxconn and the state of Wisconsin has been introduced to the state legislature. The state is offering $2.85 billion in cash, $150 million in tax incentives, and exemption from regulations. This deal may create some jobs in the short term, but overall it will put workers and ordinary people at a disadvantage. We must not only reject the Foxconn deal, and others like it, but organize our society in a way that is able to create employment without sacrificing our environment, our health, and our rights. Foxconn has made world news frequently within the past several years. In 2010, at the company’s plant in Shenzhen, near Hong Kong, amidst poor working conditions, 18 workers attempted suicide from tops of company buildings. The company’s response was to install safety nets around the buildings! Since then, the company has moved many of its factories inland where wages are lower. However, these inland factories suffer the same repression and unsafe conditions. In 2011, an explosion at a Foxconn factory in Chengdu killed 3 workers and injured 15. The ban on independent trade unions means workers in China have no formal method of collective bargaining. In January 2012, workers at a Foxconn plant in Wuhan organized a 150-strong protest on the roof of the building, threatening to jump to their deaths if the company did not negotiate on its planned production speedup. Long hours, a demanding production schedule, and restrictions on talking, smiling, sitting, and walking all lead to high rates of burnout and unrest. In September 2012, at the company’s Shanxi facility, security guards triggered a riot of 2,000 workers, causing 40 injuries and 5,000 police being called to the scene to restore order. While use of underage workers has mostly been phased out of the company since 2012, the company’s practices of low pay and exploitation continue. In July, a university in Liaoning admitted that its students were required to complete a three-month placement at a Foxconn plant in order to graduate. Why did Foxconn choose southeastern Wisconsin as a base for LCD panel manufacturing? In addition to $3 billion in incentives, and exemption from state environmental protections, Foxconn chairman Terry Gou has cited the region’s centrality within the U.S. and its proximity to trade hub Chicago. As wages in China continue to increase, the company has been looking to manufacture products closer to markets where they sell. The proposed location is close to Lake Michigan, which could provide the massive amount of fresh water needed to manufacture glass. 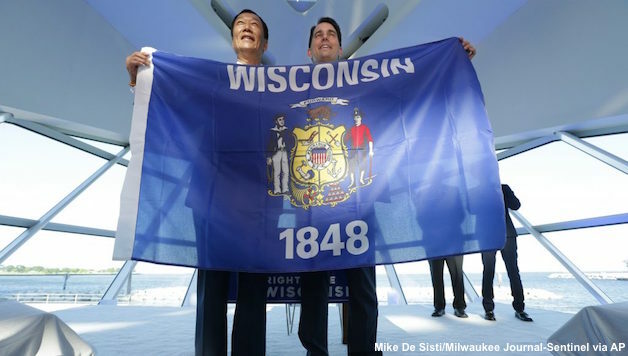 Throughout the process of negotiation, Wisconsin Governor Scott Walker and Terry Gou have become rather close. This should not be shocking — the two have much to get along about! Walker began his first term as governor by smashing public-sector unions. At the start of his second term as governor, he went after the private-sector unions, passing a new “right-to-work” law. In addition, he has handed out millions in corporate welfare, passed a new right-to-work law, and consistently sided with polluters against ordinary people. Foxconn has expressed interest in building another facility in Michigan, whose governor Rick Snyder has a similar record, including anti-union legislation, and creating the state’s emergency financial manager system, which is blamed for the ongoing Flint water crisis. Walker and Snyder have both promised to make their states “open for business,” unambiguously championing the interests of big business at the expense of working people. And this promise of untrammelled profits is what has attracted Foxconn to Wisconsin and Michigan. The Foxconn deal would create a special “manufacturing zone” for the company. This means Foxconn would receive an exemption from state environmental protections, and from permit requirements regarding waterways, allowing them to dump in wetlands which are not specifically protected by the federal government. That is not to say that pollution from Foxconn facilities will not affect federal wetlands! The bill also exempts Foxconn from regulations regarding high-voltage transmission lines. Foxconn has been caught polluting waterways before. In 2013, Chinese environmental groups reported Foxconn dumping wastewater containing toxic heavy metals into tributaries of the Yangtze and Huangpu rivers. The water was described as “black-green” and as having a strong odor. Foxconn defended itself by pointing out that it was complying with all legally required environmental regulations. Many of the solvents used in LCD manufacturing are highly toxic to aquatic animals. Can Foxconn manage these responsibly, along with nitrogen trifluoride, another LCD byproduct with a greenhouse impact 17,000 times that of carbon dioxide? Every indication says no! State officials and Foxconn have not offered information about the proposed plant’s water usage. It is likely the plant would pull a large amount of water from municipalities like Waukesha, which is in the process of switching its water source to Lake Michigan. Estimates on the plant’s potential water use range from 10 to 15 million gallons per day. Since this alone is bigger than the 8.3 million gallons per day Waukesha plans to draw from Lake Michigan, it is likely Foxconn will also have to use groundwater sources. Throughout the region, depletion of groundwater by high-capacity wells has caused a spike in levels of the radioactive element radium in tap water. The bill’s single mitigating factor is a pittance. It stipulates that Foxconn pay for two acres of wetland restoration for every acre that they destroy, as opposed to the state’s standard ratio of 1:2. Wisconsin’s private wetland mitigation system, like the failed carbon trading system, can not prevent large corporations from polluting. Just because it costs a little more doesn’t mean Foxconn can’t pay to pollute! We won’t let Wisconsin become an ecological sacrifice zone. People in Racine and Kenosha counties deserve to have clean air to breathe and clean water to drink. While corporations like Foxconn can ignore everything that doesn’t affect their profits — like long-term health costs linked to pollution — we can’t afford another planet! Foxconn, like many multinational corporations, has a history of reneging on pledges to create jobs. In 2013, they pledged a 50,000-job investment in Pennsylvania which never materialized. This also happened in Vietnam in 2007, and in Indonesia in 2014. WEDC, Wisconsin’s public-private agency which oversees job creation programs, has routinely awarded cash to companies who do not fulfill their promises. Either way, the deal can only boost the profile of Foxconn and credit-seeking politicians like Governor Walker and President Trump. When the jobs fail to appear, the news cycle will have already forgotten about the whole thing. LCD manufacturing itself may already be on a decline, being replaced with OLED (Organic LED) technology. Reportedly, Apple plans to make every iPhone with OLED displays by 2020. Samsung separated its OLED and LCD business and initiated an “exit strategy” for its LCD business in 2016. Building these factories, overproducing LCDs, and shortly leaving them shuttered would be an immense waste and a spur for climate change. WEDC has argued the Foxconn deal would a stimulate the Wisconsin economy and university system. The construction of the $10 billion campus, including housing and stores, would boost contractors in the short-term. But these profits would benefit large businesses and would fail to stimulate the economy for most ordinary people. With the help of the state, Foxconn is looking towards the university system for engineers. A state legislator even argued to cut funding from university programs who won’t create an engineer pipeline for Foxconn. Investment in education and technology is much needed, but it can’t be bound to corporate interests. The jobs creation figures given by analysts are overly optimistic, focused on the short term, and do not factor in the likelihood of a highly automated plant leading to far fewer jobs than promised. Foxconn has a history of automation, boasting in 2016 that it replaced 60,000 workers in a single plant with robots. The deal does not guarantee anything about the conditions of the jobs themselves. Entry-level jobs are likely to pay around $13 an hour — not much given the state would be paying between $230,000 and $1 million per job. Due to the low tax rate the company would be paying, the Foxconn deal would remain a drain on the state budget until 2043. The Foxconn deal is part of Walker’s neoliberal economic plan: billions in cuts to public education and social services, combined with deregulation, tax cuts for the rich and bribes to corporations. This year’s state budget instituted new austerity measures including drug testing and “workfare” requirements for SNAP and Medicaid recipients, effectively cutting 64,000 people’s benefits. How dare they take away people’s food stamps while bribing a corporation with a yearly revenue of $136 billion! A handout of $3 billion is equivalent to $1,300 for every Wisconsin household. Imagine what could be done if we invested $3 billion in public goods like green jobs, education, healthcare and infrastructure! When we consider “job creation” programs, we should take into account not only the jobs themselves but their social impact. Across the country, and especially in the Rust Belt, manufacturing jobs which have provided for families in the past are in decline. While Wisconsin’s economy remains heavily reliant on manufacturing, the state has been losing these jobs at a rate much higher than the national average. With the Foxconn deal, Scott Walker has sent a clear message: now that Wisconsin’s labor movement is weak, and there are fewer regulations to get in the way of business, we’re ready to rebuild the manufacturing sector. Competition between states for jobs has caused a steady decline in the status of ordinary people. Yet our dependence on the capitalist market has allowed politicians to use the promise of jobs to push deregulatory agendas. Notably, Donald Trump ran his presidential campaign on restoring American manufacturing to compete with China. The Democratic Party, while for the most part opposed to the Foxconn deal due to its particular inefficiency, still accepts the same neoliberal approach that leads down this road. Three Democratic legislators in Wisconsin, Peter Barca, Cory Mason, and Tod Ohnstad, have gotten behind Walker’s deal. Madison’s Democratic Mayor, Paul Soglin has called Walker’s specific proposal “a terrible deal.” But he has also been pushing to bring Foxconn to Wisconsin, suggesting they build in Madison at the site of the former Oscar Mayer plant. The Oscar Mayer plant used to be Madison’s main source of unionized manufacturing jobs, but the company shut down the plant and relocated to Chicago. This tendency to shut down good-paying unionized factories only to “bring back” non-unionized, lower-paying jobs is fundamental to the capitalist system. To improve conditions for working people, and to put an end to environmental destruction and climate change, we need to break away from capitalism. When companies close up shop to move somewhere wages are lower, we should take the facilities under public ownership and democratic oversight instead! This requires a mass movement of workers and environmental activists operating independently of big business and its political parties. We need to build a new party for the 99%, based in social movements, which can unapologetically fight for ordinary working people and environmental justice. Ultimately, solving these problems requires a decisive break with the capitalist system. The profit-driven system of capitalism creates immense waste and is incapable of providing basic job security. Only a socialist model based on democratic ownership of the heights of the economy can tackle the problem of resource allocation in a rational, sustainable, and equitable way. Moving forward, we need to build a movement in Wisconsin of environmental activists and working people, unionized and unorganized, to oppose Foxconn. If we refuse to let jobs be pitted against the environment we can unite to take on Walker’s neoliberal agenda. No handouts to Foxconn. Use the money instead to fix infrastructure, invest in public schools, and for green jobs programs. For public investment that takes society into account and values workers as humans rather than economic inputs. No poverty wages! For a $15 minimum wage. Demand that Foxconn or any new factory operating in Wisconsin pay at least as well as the manufacturing jobs that have been lost. Labor unions should fight to organize Foxconn! Fight for the repeal of “right to work” and Act 10! Protect and expand environmental protections. For a green jobs and infrastructure program! Transition our economy to sustainable energy. For democratic public control of the top 500 corporations in the US to serve as the basis for a socialist economy based on human needs.